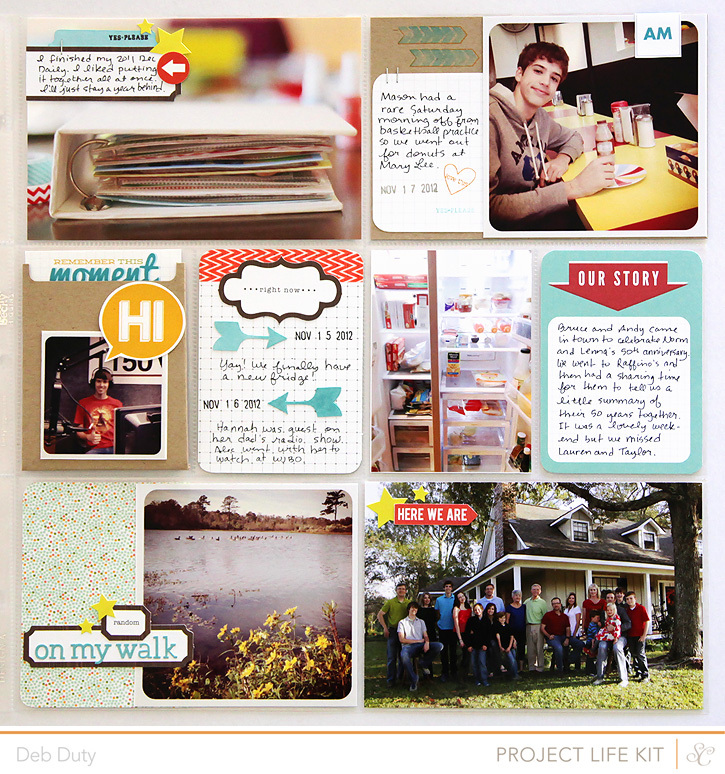 The Studio Calico January kits, Block Party, have been revealed! 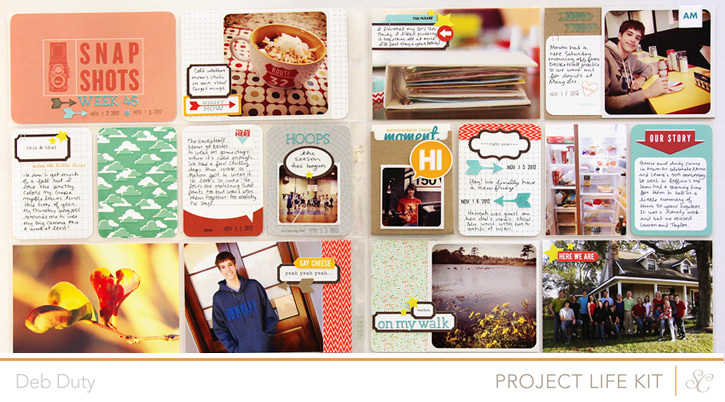 I am very excited to be using the Studio Calico Project Life kits for my albums this year. The first kit was just amazing! It is sold out, but you can still get on the wait list to receive February's kit. I have seen it and it is just as awesome!! The January Project Life Design Team gallery is live at Studio Calico so be sure and check it out to see all the different ways the team used the kit. 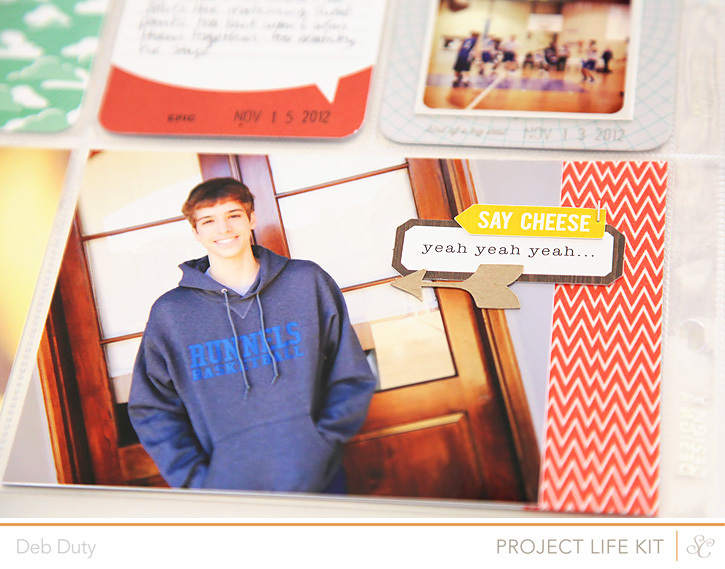 We each made one layout using only the Project Life kit, and a lot of us made additional layouts using the main kit, the card kit and/or some of the add ons along with the Project Life kit. 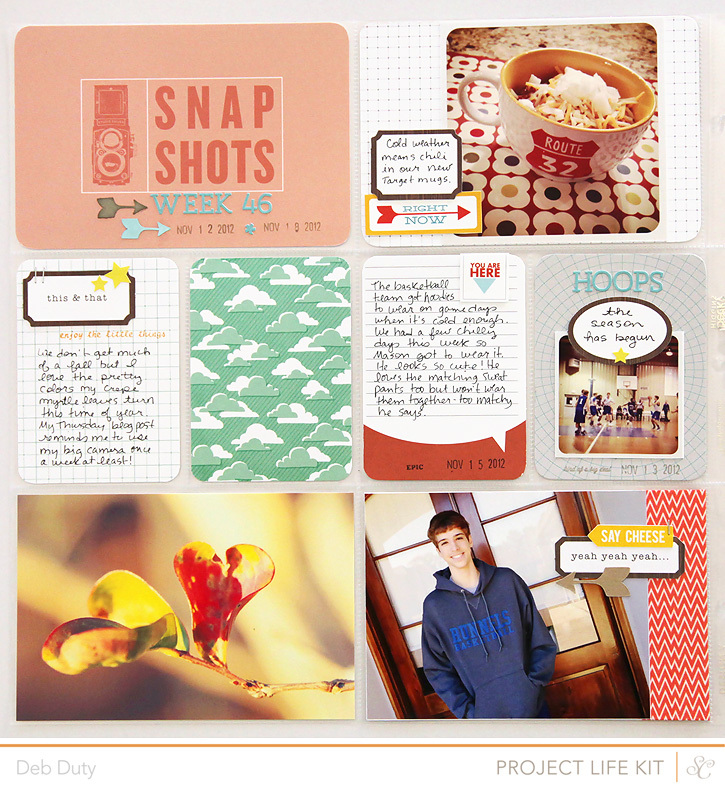 The card kit was especially fun to use because the smaller scale of the papers is perfect for Project Life. 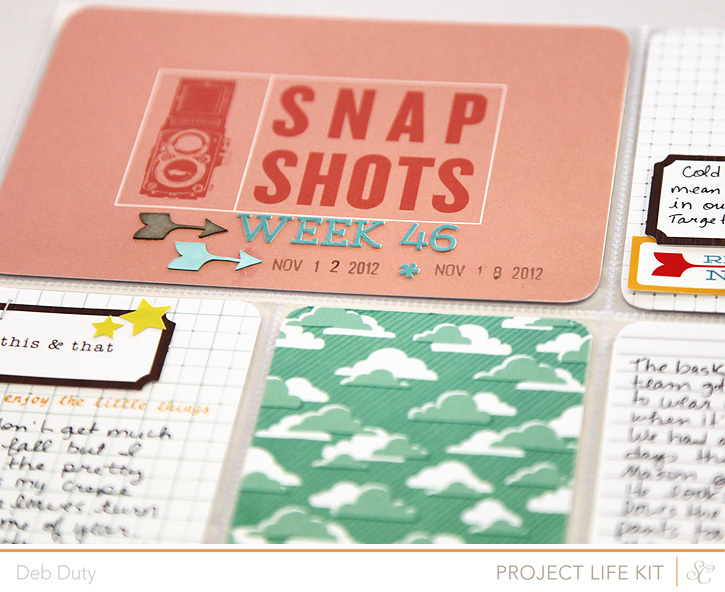 Here's my week 46 layout which is my layout using only the Project Life kit. 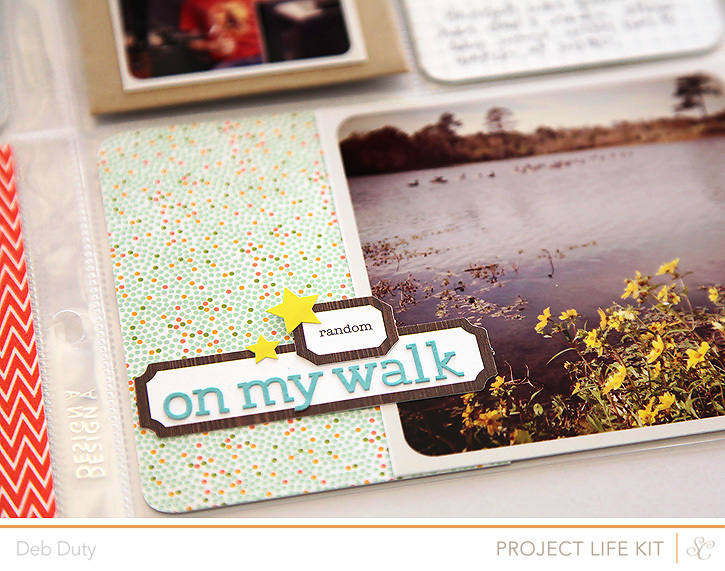 I love the woodgrain labels and one of my favorite cards was the dotted pattern under the 'on my walk' photo. That same pattern can be found on paper in the main and card kit too! I will share the other two layouts I made with the Block Party kits soon, or you can see them in my gallery at Studio Calico! I just love the add ons you use! Makes everything really pop! They are by Basic Grey and I think they are exclusive to the kit, but they are similar to the mico monogram alpha stickers by Basic Grey. love what you've done with the kits! 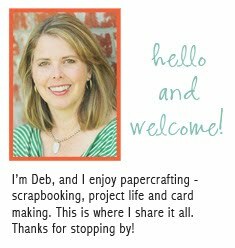 Looks awesome Deb! Happy New Year! Awesome!!!! I wish you a fruitful and crafty 2013!!!! I like the way this kit is made. It is indeed awesome! Thank you! I print the small square photos for the 3x4 cards at 2.25x2.25.